New Jersey based Landscape Architects, Harmony Design Group have been transforming residential landscapes for over 6 years. Since discovering Shaderlight, they’ve been been able to transform their SketchUp design presentation and wow their clients. Having used SketchUp to visualise their ideas for over 3 years, we spoke to Marc and Anne Marie to find out more about just how Shaderlight has impacted their work. What is a typical project for Harmony Design Group? A typical model for us consists of existing site elements (e.g.. The client’s house) as well as the proposed design (e.g. Pool, patios, plantings, etc.). The majority of our models are for clients that occupy 3-6,000 Square Foot homes that are looking for a complete landscape and/or pool design. Once we add the necessary elements in SketchUp, we then edit the numerous materials, add lighting and edit the sky with Shaderlight to produce our photorealistic image. Before we installed Shaderlight, our models were kind of bland and lacked that extra element of realism. How has Shaderlight changed your SketchUp workflow? Originally, we would have to send our model to another company to be converted into a Photorealistic model/images. Now that we have Shaderlight, we can transform our model in-house. Since using Shaderlight, we’ve probably cut out about two to three days in waiting time per model. Not only have we gained half a work week, but we’ve also gained complete control over the model’s photorealism as well. Are there things you’ve been able to achieve using Shaderlight Pro, that you weren’t able to achieve before? 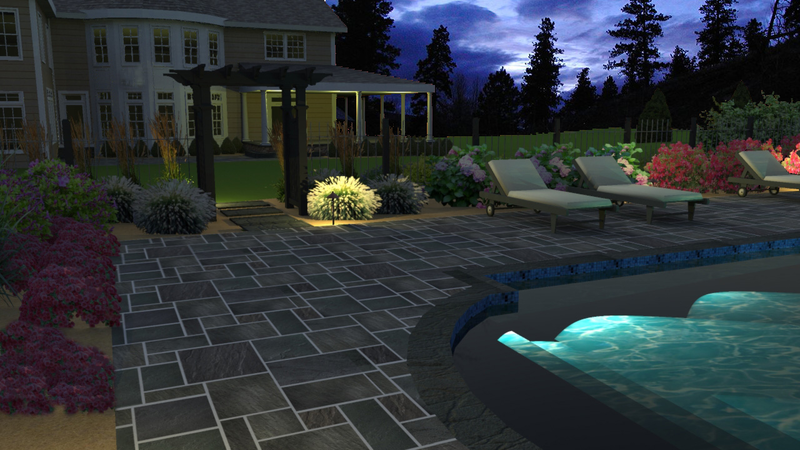 Without Shaderlight, we would not have been able to effectively show our client how the design would look at night. 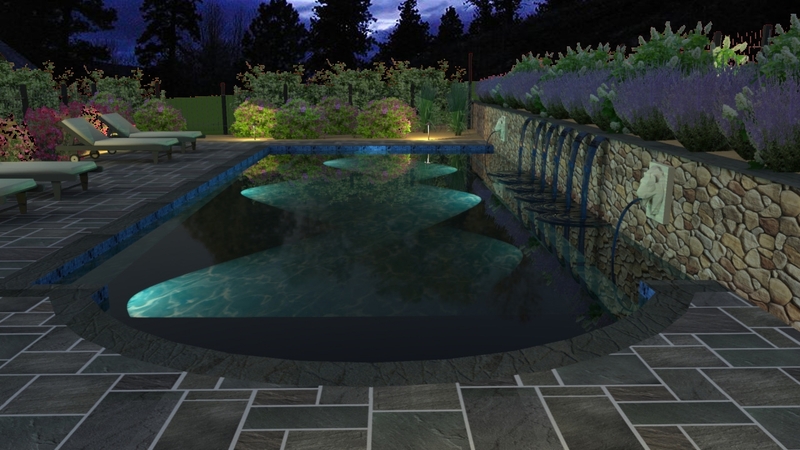 By adding the necessary lighting to the pool, home, and landscape, we can really begin to envision what the site will look like and then make any necessary tweaks. 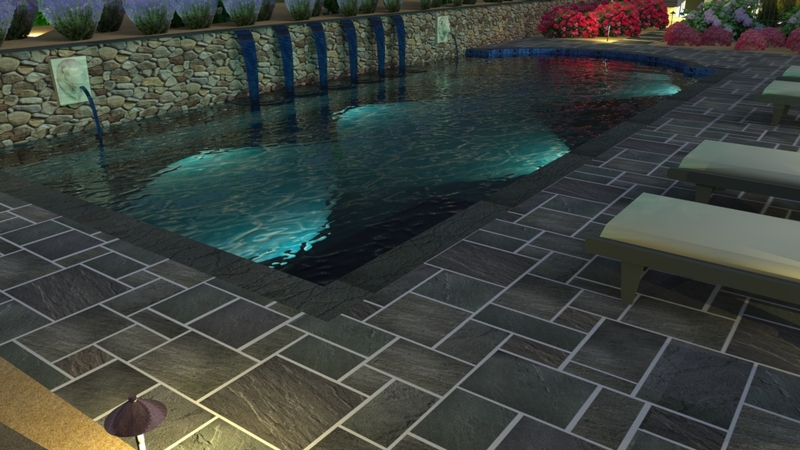 The detail in the material is vastly different than any other rendering software that we’ve used. Whether it’s the comparable color or texture of the “real” thing that we’re trying to render, we’re very pleased with the options Shaderlight provides. Other programs made it difficult to achieve, for example, a limestone texture. Not only has Shaderlight made the execution easier for us, it also provides realistic results. What made you choose Shaderlight Pro? We chose Shaderlight because it’s simple to use and fast! After experimenting with the trial version for a week, we knew we had to have the program in our office for good. With Shaderlight Pro, we loved not having to wait for the image to reload every time we made a change to the model. We were excited to have added features such as the accuracy of the Physical Sky as well as all of the extra lighting features. Photorealism is very important to our projects because it allows the client to see the design we’re proposing without being distracted by a model that screams “Computer Generated”. By adding the Shaderlight elements, they’re able to really envision what the site will look like. You can’t deny the realism of Shaderlight! What reactions have you had from your clients to the renderings you’ve created? They’ve all been great! Most clients can’t believe how realistic the imagery looks. They also get really excited about the project and cannot wait for the installation to come into being. What other rendering software have you used in the past? Before we tried Shaderlight, we tested the Twilight Render Plug-in. While Twilight was able to emit realistic imagery, we found Shaderlight to be so much easier to use because it didn’t have all the confusing presets and complex settings to overcome first. What projects are you working on next with SketchUp and Shaderlight? We are currently working on a design for an estate in Central New Jersey that was built in 1939. The client is doing a complete renovation to the house and landscape and has found it very helpful to see the 3D imagery. Once the I’s are all dotted and T’s crossed, we are going to produce a full set of photorealistic imagery for the client. If you want to see how Shaderlight will transform your SketchUp renders, the basic version of the software can be trialled for free, with no registration required. For the Pro version, a trial is available for 14 days, with a cost of $199 thereafter. Until the end of March you can also get 25% discount on any full price purchase of Shaderlight Pro.